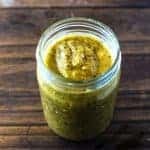 It goes without saying that this Homemade Roasted Tomatillo Enchilada Sauce (Green Enchilada Sauce) is heaps better than any of the store-bought canned stuff with those added preservatives. 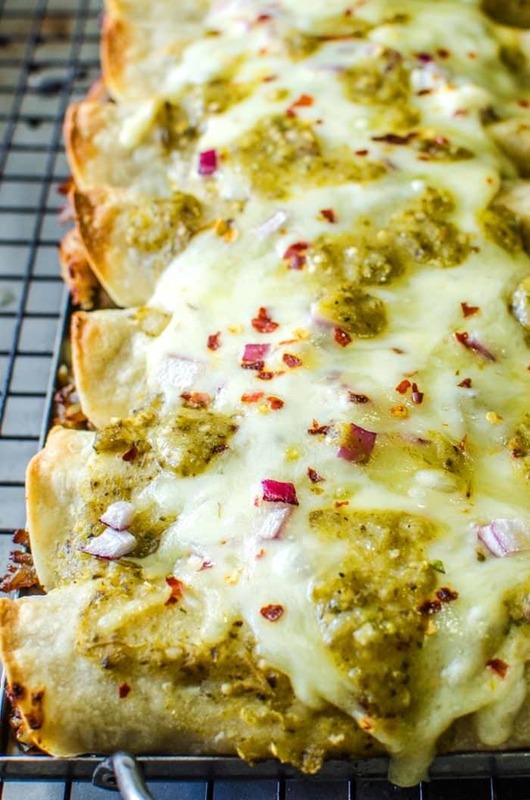 With a little kick from jalapenos, concentrated flavour from roasting tomatillos and pablanos, a little tang from lime juice and all the amazing spices, this delicious homemade green enchilada sauce will transform anything you pair it with! 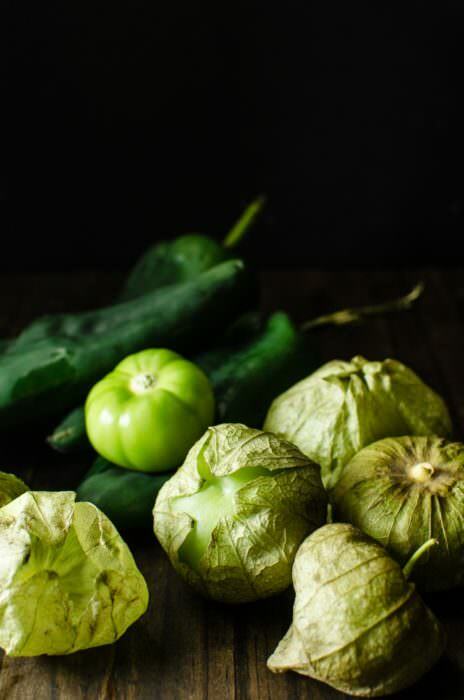 Following my tequila braised slow roasted pork carnitas and the roasted tomatillo salsa verde, I’ve got another lip-smackingly delicious sauce of Mexican heritage to share with you guys today – this Homemade Roasted Tomatillo Enchilada Sauce (Green Enchilada Sauce)! 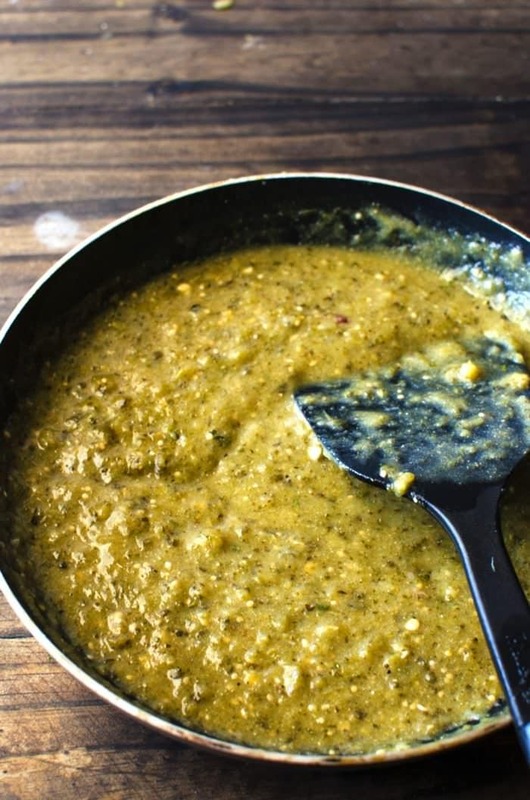 The base of this green enchilada sauce is my roasted poblano and tomatillo salsa verde, but you’re welcome to use your favourite bottled salsa verde if you like. Please note though that my tomatillo salsa verde is quite a thick salsa with concentrated flavour due to the roasting of tomatillos and peppers. For the liquid component in this roasted tomatillo enchilada sauce, I used some of the leftover stock from my slow roasted pork carnitas and it’s easily one of the best decisions I’ve made in recent times! 🙂 All those amazing spices, lime juice, milk, tequila, lard etc. yield such incredible flavour to those pork carnitas, that leftover stock really perks up the flavours in this green enchilada sauce as well. HOWEVER, that doesn’t mean I’m going to leave you high and dry if you don’t want to make pork carnitas just so that you have enough stock to make this sauce. 🙂 Instead you can use chicken stock, or pork stock, or vegetable stock and mix in some lime juice, cumin, coriander and milk, and you still get a wonderfully flavourful liquid component for your enchilada sauce! 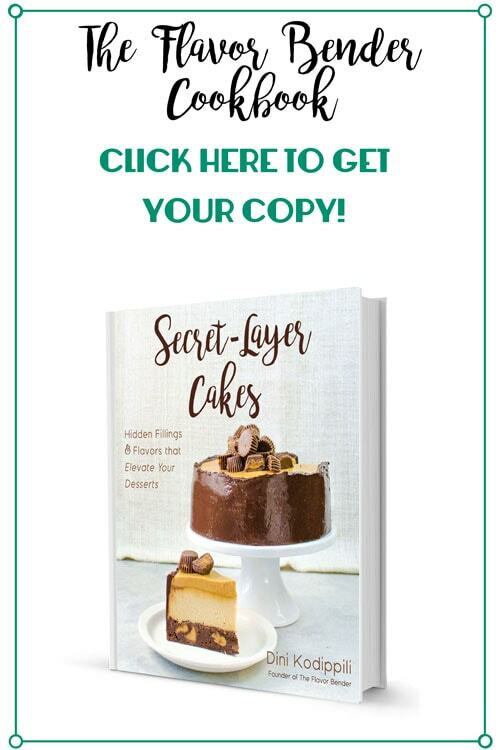 I have included all this in the recipe, so that you can make your pick. But remember to add more or less liquid, to get the consistency that you desire. Place the oil or butter in a nonstick saucepan and heat over medium heat. When it's heated, add the flour and mix well to create a roux. Stir for a few minutes until the flour is cooked and forms a paste. Add the stock (or the ingredients for the stock) into the saucepan and bring it to a simmer and let it thicken. Stir in the salsa verde and heat through. Add salt to taste (and extra stock if you need to thin it out). The charred tomatillos and pablanos with that great smoky flavour, the extra heat you get from the jalapenos, the tang of lime juice, the creaminess of milk, and the spices all come together in this flavour-packed homemade green enchilada sauce that’s fantastic on your enchiladas or pork carnitas or any Mexican dish that’ll be perked up with some sauce. Can this sauce be frozen rather than canned? Yes it can be 🙂 I haven’t done it myself, buy I see no reason why it couldn’t be! I couldn’t tell you how long it will last in the freezer, but I would personally use it at least within a month. Hello there 😀 This looks soooo delicious! Do you have instructions to can this? How long do you process this in a water bath canner? So some recipes call for the outer blackened skin to be removed. Not so here? 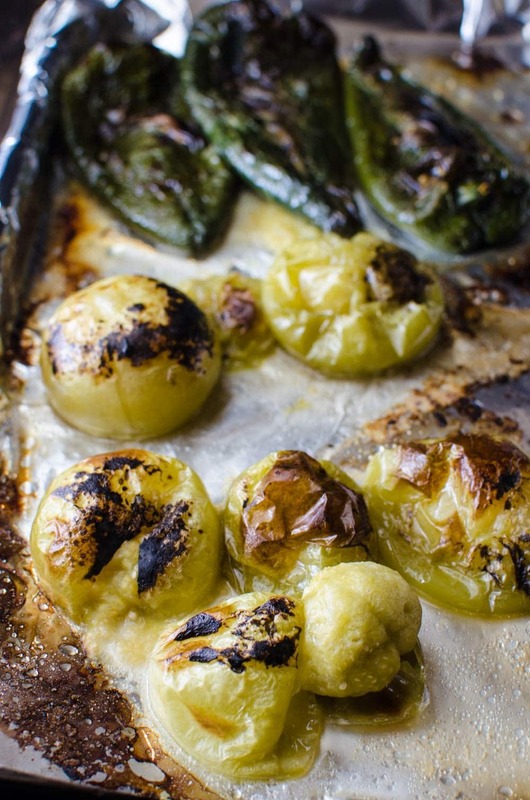 I removed the husk before roasting the tomatillos, but I did keep the charred skin because I liked the smoky flavor they add – however you can remove it if you prefer 🙂 Hope that helps! Hey Dini! 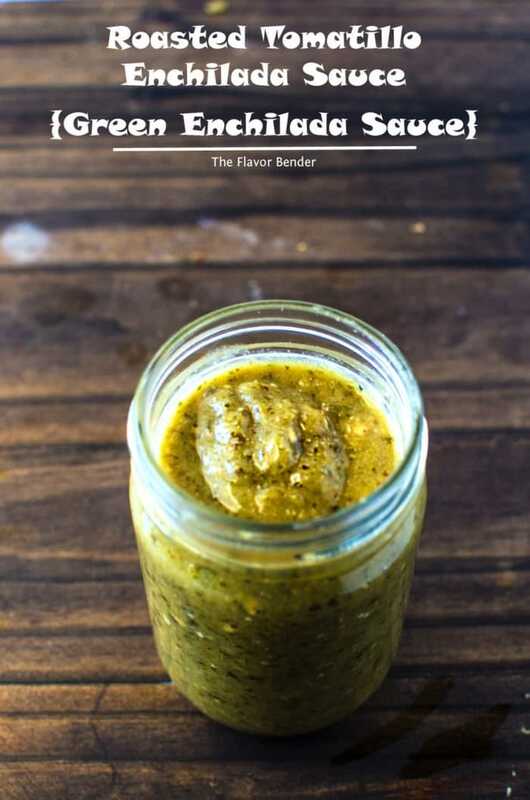 This green enchilada sauce recipe looks great. I only tried the red enchilada sauce till now. Would love to tasta this. Will be cooking this soon. Saved. I love sour tomatilloes! Specially on a total sandwich and in taco. Roasted it is something I never did before. Can’t wait to try it out. I have to have Dini night at my house. We are all loco for Mexican flavors. Well, I say “all” but Iris is afraid of heat. She’ll learn. Anyway, I have to do your salsa, carnitas and then make this sauce. Sounds just delicious.